A thematic approach - Show Me WOW! This is a way of teaching and learning, whereby many areas of the curriculum are connected together and integrated within a theme. It allows learning to be more natural and less fragmented than the way, where a school day is time divided into different subject areas and whereby children practice exercises frequently related to nothing other than what the teacher thinks up, as he or she writes them on the chalk board. It allows literacy to grow progressively, with vocabulary linked and with spelling and sentence writing being frequently, yet smoothly, reinforced. It is, after all, how we, as adults, learn new things. Don’t we start at a point of interest and branch out from it like ripples from a stone thrown in the water? will present fewer discipline problems. will find teaching less hard work…. ………but will still find teaching exhausting! (Sorry, I have not yet found out how to overcome the exhausting bit, so can give no tips here! an interest that just happens to have taken over the children’s or your imagination at the moment. For example: Grade K National Curriculum Language Arts, first weeks of school. This teacher started with the theme of birthdays.The children will help her decide on some labels. Another Grade K theme: The Beach. Which areas of spoken and written vocabulary can I work on for spellings within this theme? Which different genres can I get the children to write in, using this theme as the starting point..like letter writing, imaginative writing, recorded writing, play writing, how to writing, poetry writing, reported writing etc? Which other curriculum areas can be easily and naturally connected to this theme? How can I make this theme have a visual impact on my classroom? How can the pupils and I present the work so that everyone feels they want to say “Wow”? 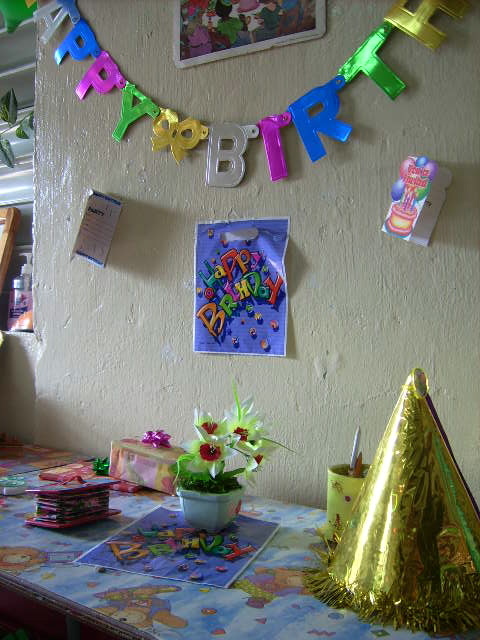 A simple example of starting and developing a theme is of a Pre K class of 12 children, where there were limited opportunities for imaginative or creative play. I suggested making a home corner by swiveling a book case so it made a right angle to the classroom wall and adding two old plastic easels where the paper supports no longer existed and were now spaces! These spaces became the house “windows”. The children made plant pots and flowers for the “window boxes” (the old paint pot trays). They helped draw and colour a third window to stick on the wall. We worked out how many curtains we would need for our three windows and I made six simple curtains on which they did sponge prints. They incorporated sorting skills when we found some plastic fruits and vegetables and they each made a paper plate which we stuck on a painting of shelves and they talked about how many of the 12 plates would go on each shelf if we had 3 shelves. Then we made a book about all this using low reading age score words in simple sentences. The book was put in the book nook and individual children could be found spending a long time “reading” the pages of the book called “Our little house”. “How long should the theme last before I drop it?” ask many teachers. Organise the classroom to set up a central display, perhaps a model or a large wall display, so there is space around your theme area for the children to sit close to it during talking and listening time. It is easier for them to imagine the events going on if they can see the setting, (and why should the teacher always have the best view?) Then the fun starts! This could be “Bottle Village”, or a space station, a shop, an underwater scene, a restaurant, a home corner. Cover the wall or display area with anything you have available that can be used as a background. Be imaginative and creative about how you build up the display using boxes, coloured paper, fabric. Think 3 dimensionally. Displays are more exciting if they are not placed flat and squarely onto a wall. Think about this when displaying sheets of paper with written work on too.They don’t have to be set flat on the wall, but can be waved with a space under the “wave”. Clearly, and using lettering appropriate to the child’s reading ability, label the main things on the display. Later, a child can collect up the labels and put them back in the correct place. 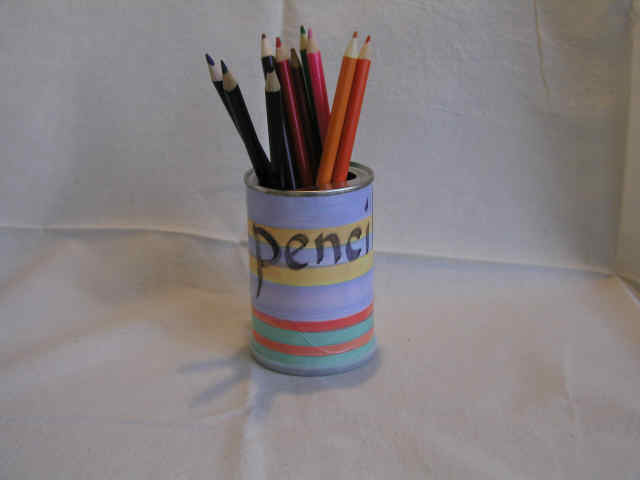 With good quality labeling, the children can refer to the labels or go and collect and return them when they are writing and want to be sure of a spelling. Invite the children to sit around the display and discuss it. Allow them to invite children from other classes to come in and see it. Give ample time thinking and talking; both are important facets before the start of writing. Talk about what they see in the display, what it is about, how it makes them feel, what they might add to it. If it is a place, talk about the sounds, the smells, the way being there would make them feel. Encourage adjectives and adverbs from younger children, similes and metaphors from older ones. Please note….The children should feel familiar with the display and should not feel it’s a “Don’t touch” place. Have the children around you and near to the model as you explain the theme. Get them to practice carefully moving from their seats to the theme area, so that a calm atmosphere is created and maintained. Once there, they need to be in the best possible position that will encourage them to give you their full attention and not be distracted. Be brave and use different voices for the different characters who might speak. Put lots of expression in your voice and try to make sure the children are visualising as you go. Point as you go, to the various things on the display. Children like to look as well as to listen and the two activities aid the memory and concentration process. When you are not reading the book, leave it in a place where the children can readily pick it up to read themselves. (They must promise not to tell the ending to others if they get that far in the story). Never hide a book you are reading away in a drawer for another time. By doing that you are missing out on an ideal opportunity to encourage someone to read, and we never want to do that! The best thing is to prop the book on a stand, (maybe made from an old wire coat hanger), and keep this on the actual display to temp anyone to have a read. Make the whole thing fun. Visual memory promotes independent writing and good quality displays promote visual memory. Once writing has started, allow children to leave their seats to go to the display for words. They can copy the word they need, but they should, when ready, be encouraged to go and look,“write the word in their brain” and return to their work, remembering the word shape.They can always go back again and check.This is important. It encourages visual memory and improved spelling. The children need vocabulary word lists (a word wall) to refer to when they are writing.A word wall will make the children more independent, less frustrated and more constant in the focus on the theme of their writing. A line of children lining up at the teacher’s desk for words is time wasting for both you and them and it is distracting for the others who are trying to work. Leave some wall or shelf space nearby for labeled additional displays that enhance the theme and that then becomes a gallery for the children’s work to be displayed and celebrated. Remember, always pre-empt this with lots of looking, thinking, talking and discussing. Get them to draw a picture and write a sentence about it. The youngest ones will need you to write the words so that they can copy your writing. Offer a variety of ideas for the drawing, but do not impose your own. After all, how do you know what they are thinking of drawing? At the bottom of the card, maybe in different colours, is a jumbled list of the missing words. 1.First stage cloze procedure cards, usually have the missing word at the end of each sentence, progressing to later cards with the missing words being in the middle of each sentence and finally to the more difficult cards being with the missing word at the beginning of the sentence. Cloze work encourages children to take contextual clues, an essential reading skill for all readers. Cloze also allows the children to work independently. Make a sequence of cards getting the children to work through this sequence, so ending up with a complete story. 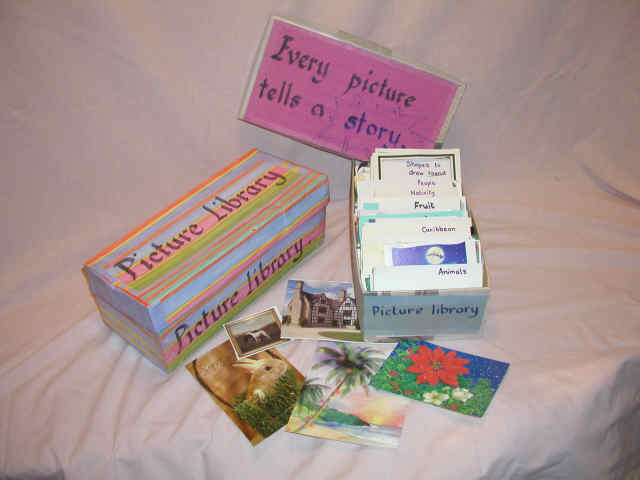 This could be a shortened version of the theme story, or it could be the Christmas story , in which case the teacher can illustrate this set of work cards by using a sequence of Nativity pictures from old Christmas cards.etc. The cards will last for years if each one is protected in a see-through plastic bag whilst the children are working from them. For the next stage, progress to question cards, insisting that the answers are given as complete sentences. A sentence always starts with a capital letter. A sentence always ends with a full stop, (or question mark, or exclamation mark). A sentence always makes sense. If the theme is not a story, try to put a story into it in the way in which you present it. Remember that when you read to them, you are also being a role model for when they read. If the theme is story book based, here is an introduction to the theme tips. 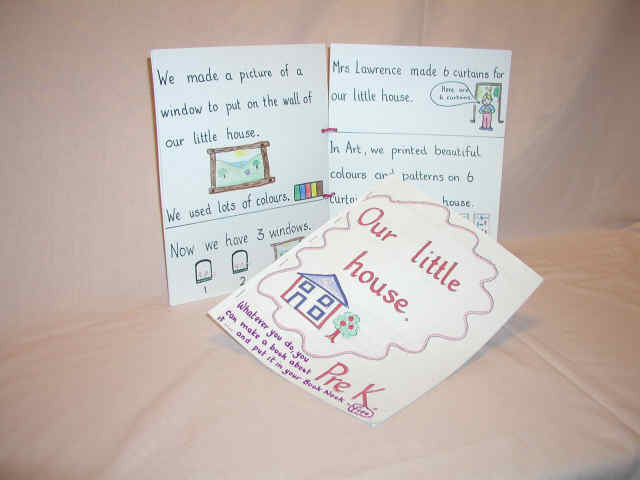 1) “Our little house” by Pre K… for the youngest children. 2) “Bottle Village ” by Chris Lawrence…for primary and low-attainment secondary pupils. 3) “A Cow called Boy” by C Everard Palmer…for older primary/ early secondary pupils. 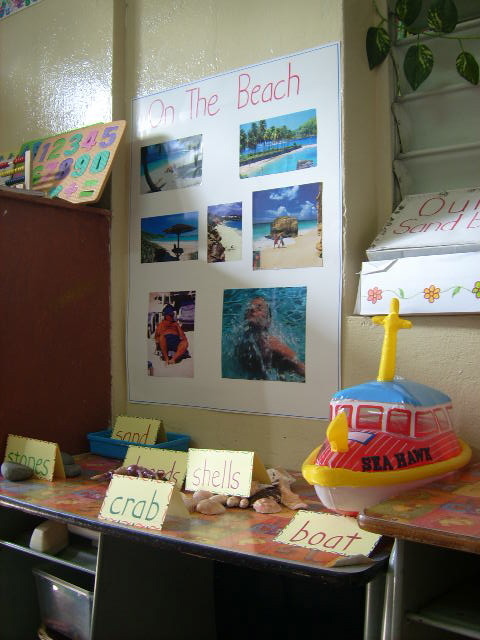 Bula im a year 1 teacher at Draiba Primary School here in Suva Fiji and am in my second year of using the thematic approach in the classroom…Very happy to have found this site. I am glad you are finding the site useful and I hope you find it fun too. I enjoy writing it and I enjoy hearing how teachers and parents respond to it. Good luck in your teaching. It is a wonderful job especially if you make it come alive! The site helps you do this I know. i want to know how i can have thematic link of Romeo and Juliet with History of India in 18th century.